I really enjoyed this although it is probably the book I know best out of the series and have reread the most. I loved the excitement of the quidditch World Cup and the triwizward tourmanent within this book and for me this is the book where everything starts to turn just that little bit darker especially at the end of the book. Lots of twists and turns to keep you guessing and while there was a lot of back story and subplot included that probably slowed the story down a fair bit I did enjoy having that detail as a bit of a mad fan although I'm not sure how others would have liked it. I re-read this one late last year (second time around). I came VERY late into the Harry Potter thing, even though the books were still coming out as I was growing up. The last book came out while I was in high school and my older sister loved the series so it's strange that I never gave it a chance until high school. Even then I only just finished The Order of the Phoenix a few weeks ago. 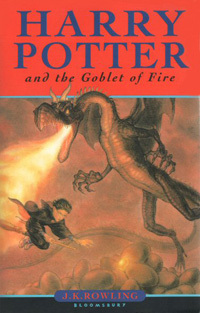 I loved Goblet of Fire. I'm not going to say it was perfect, but it was just a great read. There's so much going on and I loved the enormity of this book. It's also where Voldemort is reborn--an inevitability that just raises the stakes for the series. I agree about the film adaptation. As a whole, though, I loved it too. Despite all the omissions.